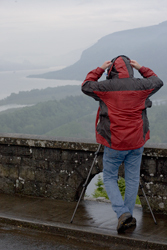 The Columbia River Gorge area is like stepping into another planet. A planet full of Jurassic green ferns, towering moss covered canyon walls, and roaring waterfalls at every turn. Few places in the world have as many large waterfalls in such a compact area as the gorge. It brings in visitors from all over the world to see them and feel the mist from these giants as they walk near. May is special for the Gorge. Nature takes the saturation slider and turns it up making the greens and yellows of the foliage even more vibrant. The water from the mountain snowpack has begun to melt, and combined with those April showers creeks and streams are pushed to the breaking point. The waterfalls are roaring. 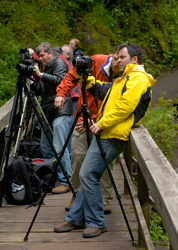 A group of eager photographers met Aperture Academy instructors Brian Rueb and Kevin McNeal for a weekend of fun and adventure (and walking) in the gorge to see some of the best waterfalls the area had to offer. Orientation on Friday gave the instructors a chance to meet the new students, reacquaint with returning students, and provide the class an outline of what to expect for the weekend. While the orientation made point to talk about the hiking involved to some of the waterfalls, I don’t think anyone is ever quite ready for the adventure the Gorge can throw at them before it shares its beauty. Saturday morning began to a steady rain. Even though the chance of a colorful sunrise was out of the question, we still took the opportunity to get out and photograph. 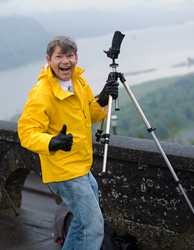 The first stop was one of the many scenic vantage points from the top of the Gorge, overlooking the mighty Columbia River and the layers of Cliffside as they fall abruptly to the plains below. 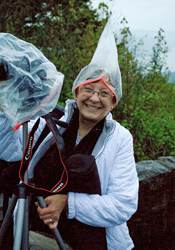 The class braved the rain with umbrellas, jackets, and a variety of other creative methods. 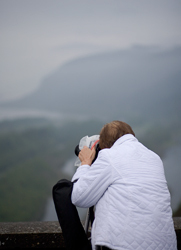 The instructors worked with the students to show them a few interesting compositions that utilized the layers of the cliffs and the iconic vista house located on the next ridge over. Even though the color wasn’t there, the early morning blue hour made for some moody and interesting images. Instructors helped some by cooling the white balance down so the mood could be enhanced even more. We left the first ridge and moved to the actual Vista House so students could continue to photograph the valley below as well as the interesting stonework from the vista house. This time was good to help Brian and Kevin get to some of the more technical issues some students have with learning their camera on manual settings before we get into the main focus of the weekend...WATERFALLS! While grey overcast days are a nightmare for sunrise and sunset photography, there couldn’t be a better forecast for spending an entire 2 days photographing waterfalls. The light is muted, and it helps for getting a better exposure on the scene, without the brunt out hot spots a sunny day can create with the roaring water. The first waterfall of the day is the most iconic waterfall in the Gorge, and with exception of Yosemite Falls in California one of the most iconic in the whole Western United States. 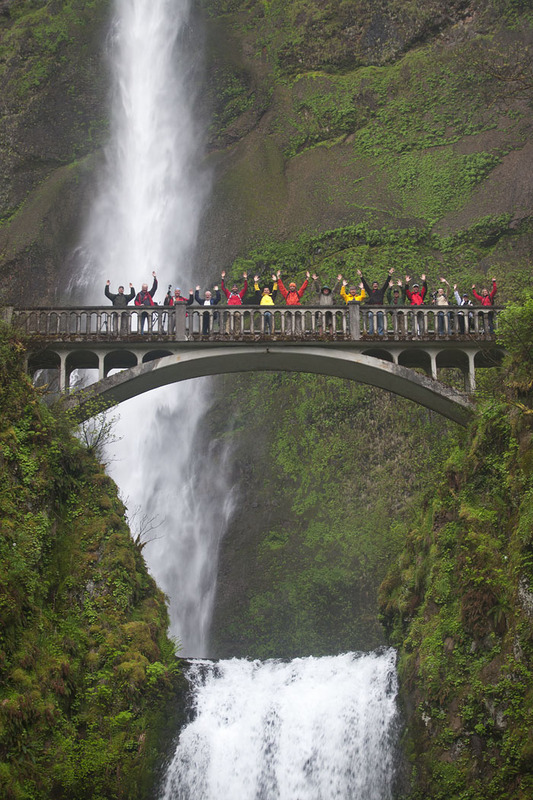 Multnomah Falls is nearly 650 feet tall it spills from the Gorge in two gorgeous tiers. Seeing it in the morning allows our class the opportunity to spread out and photograph it without the mad rush of tourists that make their way to the location throughout the day. The waterfall has so many options on how to photograph it. There are classic close ups that show off the stone bridge that separates the two tiers. Shots from farther away give a sense of scale as to how large the top section of the falls is. Even though it’s iconic, and everyone has seen a ton of shots from here, it’s always impressive, and there’s nothing quite like having your own shots from the location. Brian and Kevin moved the group around, and gave suggestions on how multiple exposures can be beneficial for these waterfalls to help stop the motion of the foliage surrounding the waterfalls that tends to blow about in the mist and wind caused by the water. Waterfall photography is always a bit tricky. 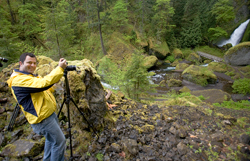 Not only are there different sizes of falls in a typical scene, but there are usually creeks or streams cascading at different speeds through the image. 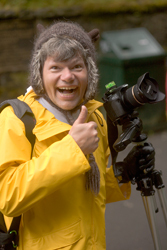 This sometimes requires a second exposure at a slightly faster shutter speed in order to keep the detail in the falls that will ultimately make the finished image more appealing and avoid any burnt out highlights. 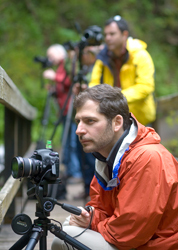 When we’d shot Multnomah Falls from the bottom and on the bridge it was time for a break. The class went back to the hotel for a bit more breakfast, some coffee, and a chance to finish drying off from the morning showers before heading back out. The second batch of waterfalls of the day had a bit of everything. 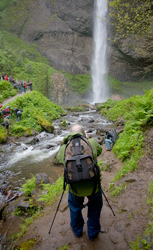 The next waterfall was Latourell falls. A long ribbon waterfall that flows over a moss covered basalt wall. With the geometric shapes and patterns of the basalt, the waterfall takes on a very interesting look. The class moved farther away from the powerful mist near the base and shot from a footbridge farther away. A few braver students ventured in or near the waters’ edge to make use of the movement in the stream as a leading line into their compositions. Kevin pointed out some wonderful patches of lush green ferns that made for an excellent bit of balance in vertical compositions. It again allowed people the chance to work on different length exposures in order to stop the movement of the plants but yet give the water a bit of blur that makes it so smooth and silky. Latourell falls is also special in that when images are composed tighter, they become wonderful abstract images that use the repetitive shape and color of the moss to create interest and aesthetic value. Everyone loved the Latourell, and the short distance we had to walk in order to enjoy it. The second waterfall of the morning session was Wahkeena Falls. Wahkeena is a curtain falls that was flowing at a powerful level. Getting close to this falls was tough, and the class hiked to the first bridge in order to get closer to a particularly scenic portion of the falls and use the bridge as a leading line into the composition. This was the first waterfall where the mist really began to create trouble for the students, and there was a constant need to wipe the lens before each shot. This gave us time to go over why a slightly faster shutter could be effective to still blur the water, but allow less time for the mist to build up on a lens. Wahkeena Falls, as are most of the falls in the Gorge is located on part of a very intricate and confusing set of trails that connects other portions of the Gorge and more waterfalls, usually located higher in the cliffs. Fairy Falls is an amazing falls set high above Wahkeena. It is certainly no easy task to get to, but our group was eager, adventurous, and ready to give it a chance. The great thing about the hike is that even if you decide that the vertical push up to the falls isn’t worth doing any longer, there is still amazing things to photograph. The trail passes right along a very lovely section of the creek where gentle cascade meander through lush moss covered boulders. 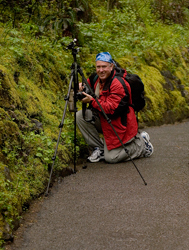 Brian worked with one portion of the group on capturing some of the more intimate, and often overlooked sections of the Gorge while Kevin and the mountain goat types scrambled up the trail farther to photograph Fairy Falls. Either way you choose it was a winning location. The class left this location pleased with their shots, and happy that they’d made such good work of a difficult hike. It was time for some Lunch, and a brief power nap before the last hike of the first day, a brief .4 mile each way hike to Pony Tail Falls. 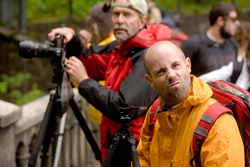 The Gorge trails system gets confusing, even for people who have been there and done the hike many times in the past. The class was treated to the scenic version of the .4 mile each way hike which really turned out to be 1.2 miles one way. Despite the extra length, the hike is very pretty as it crosses Oneonta Creek and gives view point to a very pretty little falls that is not normally on the typical route. 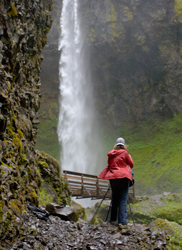 Ultimately the trail ends up at the lovely Ponytail Falls, a powerful jet of a waterfall that shoots out over a cliff into a small pool, before cascading downward and becoming Horsetail Falls near the roadway. The trail winds behind the falls which gives very unique perspectives on this powerful waterfall. Brian gave the class some brief tips on the best spots to shoot this waterfall before he had an appointment with Murphy’s Law and an exercise in the snowball effect to attend to. It was fitting in that because he took the class on an extra mile in hiking, that he would get to have 2 more miles of hiking himself getting the van and bringing it back to the class at the bottom of Pony Tail Falls, so they could avoid having to take the scenic walk back. The day ended with some great waterfalls seen, some great hiking, followed by some more hiking. The best part of the day was that everyone came away with some images they really liked. 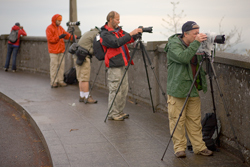 Most of the class went out that evening to share stories from the trail over a cold adult drink where they could talk more photography and share some images from their previous trips with the camera. When sleep finally came that night, everyone had earned a soft pillow and a good nights’ rest. Everyone was really excited about hiking in the morning. The class earned sleeping in on the second day and we departed at 8am instead of 4:30am like we had the previous day. Again the weather was perfect, and overcast. 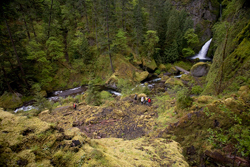 Wahclella Falls is a thundering waterfall located in the heart of the Gorge. 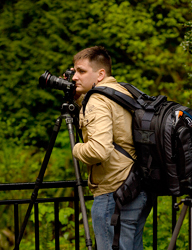 If the weather is too bright, the sun will blast the area and create very difficult shooting conditions. 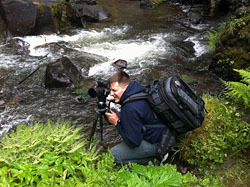 The overcast sky was welcome as it guaranteed us great shooting conditions, as well as a cooler hike to the falls. The trail to Wahclella is easily one of the highlights to the weekend. 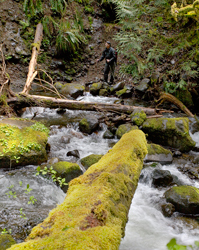 The trail follows a very beautiful creek as it winds through the lush green rain forest. 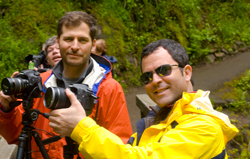 The hike is one of the more gradual climbs in the Gorge, so that is always welcome to anyone who has experienced some of the other hikes in the area. During the hike in the class picked out spots they wanted to stop again on the way out and photograph. Wahclella throws a lot of mist. The class still tried to get as close as possible in order to capture some great vertical shots of the waterfall using the vivid green moss covered rocks as a frame to balance the bottom of the shot. 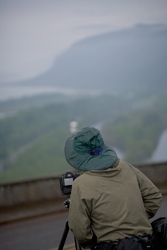 With their experience from Wahkeena and Ponytail, the students were experts at quickly wiping mist from their lenses and grabbing shots. 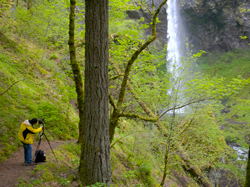 Wahclella Falls has the most compositional possibilities of all the waterfalls we photograph. 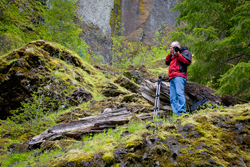 The close up shots with all the moss covered rocks is the starting point. These images change slightly in composition as you move away from the base of the falls along the river. The images still utilize the rocks and moss to create balance and interest, but add more of the creek as a leading line. Then you get to the footbridge which provides a bit higher perspective of the creek and the waterfall. It also puts you almost completely out of the way of the mist. Getting really far away from the falls, the class climbed up a scree pile to an elevated viewing area that really puts the valley into perspective and gives a pleasing ‘S’ curve to the creek as it winds its way to the mighty Wahclella. The view from up high puts the whole valley into perspective, and if it weren’t for the little footbridge, one could easily think they had travelled back in time to the time of Lewis and Clark when the wilderness ran the west. The class spent a couple hours working this whole area and putting Kevin and Brian through the paces as they scrambled about trying to spend 1-1 time with the students to give them feedback on images, as well as tips to try and battle some of the exposure elements they faced. On the way out many students stopped at the locations they had seen on the way in to grab images of the beautiful creek and lush foliage. With Wahclella taking up our morning, it was time for a brief lunch stop before heading to the last spot of the trip- Elowah Falls. Elowah Falls is almost 300 feet tall. It falls elegantly from the heights of the gorge. Even though it’s on the main road, it’s one of the less visited falls in the Gorge. A short ¾ mile hike leads to the falls, and by this point in the trip our class was seasoned in hiking and able to handle anything. They made quick work of the trail and before long were looking at the mighty Elowah. Elowah was flowing faster than either Kevin or Brian had ever seen it. The wind and mist from the impact of the falls in the pool would literally blow you back as you crossed the footbridge. Shooting this falls from some of the typical locations was impossible. No amount of skill in wiping a lens would have helped should you get to close to the base. The class scrambled to higher vantage points, and used some of the local trees to help frame the ribbon of water as it danced down the cliff side. Like Latourell falls, Elowah has some very lovely rock patterns and moss on its cliffs…these really give interest to the whole image and make the details so amazing. Whether from the left or the right, the class exhausted the higher vantage points and a few got lower and braved the mist to capture some nice images of the falls from below. Several of the students were a bit more adventurous still, and followed Kevin (in his boxers) down into the creek to wade out to some nice vantage points. Despite the site of Kevin in his boxers, many found the view of the waterfall from that location to be one of their favorite from the trip. 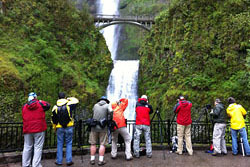 Everyone left Elowah a bit wet from the spray, but overall happy with their images and amazed at the beauty the Gorge had to offer. Several students had early flights to catch, but the rest stayed in the lobby to enjoy the fresh cookies and crock-pot soup the hotel had prepared for the afternoon. 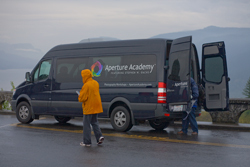 IF you know the Aperture Academy, we never met a crock-pot we didn’t like. Brian went over image review for the students who had uploaded their shots to a laptop, and Kevin did a great presentation on his processing methods and file management techniques. 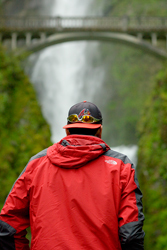 There was a lot of information to take in, but the mood was still high and it was a great way to put the cap on what had been a great weekend of fun, hiking, adventure, more hiking, and waterfall madness in the scenic Columbia River Gorge.